My fear of deep water began with my mother. Her brother drowned when she was nine. One of my earliest memories is of my mother describing in detail the last time she saw her brother, how he fell from a boat, and what his body was like after three days in the river. At 89 she still frequently describes this event in detail, and I feel how deeply she was traumatized by it. She never learned to swim and refused to come to family outings near water. She just couldn’t watch. On hot summer days after working on the farm, my 12 siblings and I would go to a local lake — I often played in the water but was afraid that one of my brothers or some other boy would pull me under — a terrifying experience for me, not being able to breathe, not being able to reach the surface. I entered the water on-guard and never went in very deep. One summer when I was about nine my mother signed up us younger kids for swim lessons. I asked her about this recently, and she said she remembered hauling us over to the swimming pool (but never staying to watch). It was a cold summer and we were always frozen and purple when she came to pick us up. I never got beyond sitting at the edge with my feet in the freezing water, watching the other kids and feeling embarrassed about not getting in. When I entered high school we were told that to graduate we had to swim the length of the pool. The fear of this test hung over me for four years and yet I can’t remember if I ever took that test. It’s possible I thrashed around for half a length or showed them I could float. When I was 21 I had an accident that escalated my fear of deep water. While cross-country skiing across a frozen river on a cold Wisconsin day, the ice cracked below me and I was completely submerged. While plunging deep down under the icy water I saw my own death announced in a newspaper: “21-Year-Old-Girl Drowns.” Fortunately I popped back up through the hole and was rescued by my adult Eagle Scout skiing buddy. Throughout my life I longed to learn to swim. I signed up for group lessons a few times. The results were always the same. The instructor would rush the group through a series of fast verbal instructions and move on. I couldn’t coordinate my legs, arms, or breathing and was quickly left behind — discouraged, embarrassed, and feeling clumsier than ever. And no one helped me overcome my fear of deep water. Throughout my life I have overcome many obstacles and fears and now at 55 I’m determined to learn to swim and to conquer my fear of deep water. At 89, I want to be one of those women I see who do lap and after lap, moving smoothly through the water. And so I begin my story of learning to swim with Beth. At 55, I’ve gone years without trying to learn to swim, and it’s been years since I’ve been in a swimming pool. But this summer I ran into an acquaintance. She looked so healthy and happy. She was biking to the Millennium hotel to swim in their pool. She did it every day. I felt a sudden, intense longing to swim. I wanted that — riding to the pool along the creek path, the confident joy. I wanted to be a swimmer. I went home and searched the Internet to see if anyone offered lessons at the Millennium pool. I didn’t want group lessons: they had never worked for me. I wanted the right teacher because despite the adrenaline pushing me to find lessons now, I knew my frustration or fear could defeat me. Beth’s website came up and I explored it just enough to see that she taught adults who were afraid of water, that she was a runner, and that she appeared close to my age — I had a good feeling about her and thought I would try one lesson. I emailed her quickly before I chickened out. I wrote that I was athletic (30 marathons) but afraid of deep water and had never grasped the coordination — using my breath/arms/legs together — to be able to swim. I wanted a supportive, encouraging teacher. Beth offered to put me in touch with some current students and thanked me for my background information and best of all, told me that the pool at the Millennium doesn’t have a deep end. While I appreciated the offer to talk to current students, I didn’t want to think too much about my lesson ahead of time. I was glad that she cared about my background — but really, knowing there was no deep end sealed it for me. I was excited before my first lesson as I wandered the hotel hallways looking for the pool — then feeling joy: the pool was in a big open room, three sides of windows and high ceiling. I didn’t know I associated pools with claustrophobic rooms. Nor did it reek of chlorine (something else I didn’t know I disliked). It was freeing that this pool had none of the negative associations with past pools (dark and smelly) where I’d been unsuccessful since childhood. I felt comfortable with Beth immediately. She was competent and gentle. We talked about how I was feeling (mostly excited) before I put on the first pair of goggles I’ve ever owned and got into the pool. I showed her that I could float on my back and front. I put my head underwater. I could blow bubbles. When I floated on my front, Beth pointed out some simple adjustments I could make to my head position. Who knew it mattered? With a few changes I felt more balanced and floated with more ease. She saw how tightly I held myself and suggested ways I could relax my shoulders and feel what I was doing in the water — in my body — not just in my brain. She had me turn over, put my face in the water, arms straight ahead, and kick to propel myself while blowing out. At first I did not move forward at all but I did get my head in and got the idea of blowing bubbles into the water. After some practice I was able to propel myself across the pool standing up just a couple of times to take a breath. I enjoyed my lesson. It went too quickly! Maybe this time I would really learn to swim. I arrived at Lesson Two, eager to learn. I was checking in with Beth beside the pool when a man arrived with his toddler for the child’s lesson. There had been a scheduling mix-up, so I quickly said, “Please take him.” I was delighted for the chance to practice in the pool. At first I felt silly floating and blowing bubbles but then I just let myself enjoy feeling silly and playing. My fun was interrupted by the terrified screams of the toddler at other end of the pool. My teacher and mom antennae went up, but I could see he wasn’t even in the water. He refused to get in, not with Beth or his dad. Beth was gently assuring. I wondered why he was so afraid. Beth took them to the outside pool and I resumed my floating and bubbles. I thought about how some kids are more sensitive than others. This can be a good thing, as well as a challenge (I count myself among the “too sensitive”). Things that happen to siblings might deeply affect one and the others don’t even remember it. When I was four, my three-year-old brother and I were playing on our farm. He decided to walk along the top of the cow tank and slid down the metal roof into the water. He was thrashing in the deep tank while I shouted desperately, “Swim over here, swim over here!” Then he floated lifelessly in the cow-tank – suddenly my mother and sister were there, screaming at me about drowning my brother as they pulled him out, blue and limp. They hit his back repeatedly to force the water out of him and maybe breathed into his nose (though I don’t remember this). My brother survived. As an adult he swims with ease, loves water, and runs his own fishing guide company. Yet I am afraid of deep water and never learned to swim. Is that tension Beth sees in my shoulders, my neck, my head all the history, fear, and sadness trapped in my body? While practicing, I let the water cradle me. I want to remember this in my body: this is now, not then when that scary thing happened. It’s just a rainstorm, not a hurricane. In my first posts my editor kept changing “my fear of deep water” to “my fear of water.” I insisted on the distinction: I love water but can’t swim and fear being in deep water. Some people who are afraid of deep water won’t go near lakes or the ocean — others, like me, enjoy being near water a great deal and though terrified, have pushed our limits by snorkeling or kayaking. Most of my adult life I lived along the Pacific Ocean in Santa Cruz, California. I walked along the steep cliffs or long beaches daily watching the waves, the surfers floating on their boards or rising and falling with those waves, the otters resting on their backs, and, when I was lucky, breaching dolphins or a whale. I loved the ocean but rarely entered the water other than to get my feet wet a few times a year. During my last year in California, I started to kayak in Elkhorn Slough off the Monterey Bay — zipped into my wetsuit and wearing a life jacket — always in a state of terror-adrenaline at being in the deep water, mixed with intense joy about being on the ocean and not letting my fear control me. Curious otters peered into my kayak and pelicans flew overhead as though I belonged on the rocking surface of the sea. When I was in the kayak, I didn’t think about learning to swim (this was brave enough) – swimming in the ocean seemed out of reach. During my third lesson, Beth had me work on “the head float.” I rested on my back, letting my legs dangle below me, keeping my head afloat. Later practicing I was so relaxed that I closed my eyes, almost falling asleep. I thought of the mother otters leaving their babies floating in kelp beds, rocked by an ocean lullaby. Beth says, “Let the water hold you,” I think the otters do. In the days after my lesson, I practiced at the Spruce Street pool, watching the sun create moving ribbons of light underwater. While practicing blowing bubbles I could see legs of little swimmers moving with ease through the light and water. I remembered snorkeling in Kona many summers ago with my daughter — it was a new world with many different kinds of brilliantly colored fish and enormous sea turtles floating over and under us. Sea creatures in all sizes and type shared the ocean. I didn’t go out deep, wore fins, a life jacket, and still spent hours in the ocean mesmerized. I let the waves rock me, though I was afraid, the beauty was too great a temptation to resist. Next time I hope to snorkel without the fear (or the life jacket). By taking swim lessons with Beth, I’m claiming my right to be in the water with the other sea creatures. Letting the water hold me, with the sun creating ribbons of light all around me, and in the pool for now. Taking swim lessons means getting undressed in a locker room, getting into a swimsuit – seeing my wrinkles and weird little bumps and saggy places and yes, some fat – and being seen. Even writing this makes me sweat. I wonder how many people won’t take a lesson because of swimsuit fear? Since beginning swimming lessons, I realize that I have been angry with my body for several years now – I felt my body had betrayed me. It is not what it was 10 years ago, though healthier than it was four years ago when I suffered months of serious illness and stronger than it was last year after a dog attack left me with two broken bones. I used to be a good runner. I ran 30 marathons, 50-60 miles every week, and five marathons a year for a long time. While running, I felt like I could fly – I loved my ropy muscles, my flat belly, being strong, being in my body. Being a runner was my identity. Runners are mostly some version of slim. In the pool there are all kinds of bodies. Beth constantly reminds me to feel the swimming motions, the breathing — in my body, not just my brain. I’m not the only self-conscious one – other women change in the bathroom stalls. This is my body at 55. I want to look in the mirror and think good things about my body and banish the self-conscious, critical voice. No more comparisons between myself, and those who can swim, no more comparisons to my younger body – this is the body I live in, it is a gift and precious. Beth is an excellent role model for accepting and celebrating the body I live in now and being grateful — she has endured her own struggles with a changing body. And it’s not just Beth; I see people who due to age or disability struggle to get in and out of the pool, a teenager who slips off her cast before lowering herself into the water, a child with a guide dog (the dog naps alongside the pool) taking lessons. I see men and women of all shapes, ages, and sizes get into the pool. I get into the pool. My hips and belly are bigger than they once were — but in the water nothing bounces like it does on land. And amazingly, after a few lessons and hours of practice, my body is changing. Muscles are developing in my upper arms, my chest, and back for the first time in my life. And I find that nothing banishes hot flashes quicker or with more pleasure than the pool. I’m not going to let my embarrassment stop me from achieving my goal. I’m doing this for me! This is the body I will love now, in water and out. And be grateful for it. Beth is teaching me the head float. With my chin and forehead out of the water on my back, I push off from the wall into the back float while keeping head and chin in a neutral position. She wants me to kick my legs while floating on my back, but quickly sees how locked my knees are. I get out of the pool, sit on a chair, and Beth helps me move my knees, experimenting, moving them for me so I can feel how it should work. Beth is a talented teacher. I’ve been an educator my whole life, working with all ages, including as a professor — so, I think I’m qualified to say this. I specialized in teaching reading (we’ll get back to Beth in a minute). Some kids learn to read organically, a larger group learns as a group in the classroom. The remaining struggling readers need specialized instruction. It takes a talented teacher to help them achieve reading fluency. In addition to teaching the mechanics of reading, lessons must be tailored to meet individual learning styles, get rid of heaps of emotional baggage (including shame, fear, frustration), build confidence, and, finally, help the learner experience the joy and empowerment that reading brings. I think a lot of this is true for teaching non-swimmers to swim. I didn’t learn how to swim organically. I need specific, personalized instruction. Beth has years of experience teaching swimming to draw on, but she personalizes her lesson. For example, after getting me out of the pool to practice kicking she could tell I still didn’t get it, so we got back into the pool and she gently moved my legs for me so I could feel the correct motion. She continually experiments and observes: you are locking your knees, here are some ways to relax them. While Beth moves my legs, I relax and float, which builds my confidence and joy in the water. I can feel how high on the surface I am floating. I wonder how I can achieve that on my own and will practice it between lessons. Maybe natural swimmers don’t think about the many small movements and minute adjustments that go into the process — just as most fluent readers don’t think about phonics. Most couldn’t show them to a non-swimmer. Beth can. Toward the end of the lesson, while I’m floating on my back, Beth asks me to exhale air through my nose, then she turns me from my back to the belly position, where I blow bubbles in the water before returning to my back to breathe. I try it several times and suddenly, jubilant, I get it — I do it! Beth grins, and I feel her authentic joy in my learning. In a recent interview one of Beth’s students told me she hears Beth’s voice in her head when she swims. I laughed, remembering my reading students who used to tell me they heard my voice when they were reading — that’s what a good teacher does, lends you her voice until it is replaced with your own. In Lesson Six Beth showed me how to roll from my belly, blowing bubbles through my nose, and return back on my back. I’d tried this before and never could do it without a nose full of water — but I suddenly did it. Then I begged Beth to let me try it again and again, full of joy that I could do it. I got it! I’ve been watching kids at the pool lately, watching how they learn. There are two tiny girls, maybe one- and two-years-old, who jump repeatedly from the edge of the deep end into the water and swim to their mother’s open arms. They laugh in the water, look like sleek little seals. A little boy does forward and backward somersaults. I want to learn like a kid. I imitate them — even as they imitate each other. Turning over, making big arm movements, kicking, doing “jumping jacks” while floating on my back. 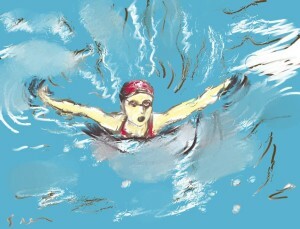 I also try pretending to swim — this seems to work well for me — trying movements the way it looks like “real” swimmers do. Beginning readers pretend to read, why not beginning swimmers pretending to swim? Sometimes I “channel”— try to imagine myself with the confidence of my 13-year-old niece, Gabriella, a champion swimmer and triathlete. When she was two and a half, my sister called and tearfully reported that Gabriella couldn’t swim yet — I assured her that Gabriella would learn and she quickly did. On one visit to their Texas home, five-year-old Gabriella patiently tried to teach me to swim (she swam with the ease of an otter by then). Patiently she demonstrated the same moves over and over, letting me practice, moving my arms for me. If I lived closer to Gabriella, I might have learned to swim years ago. Every lesson Beth helps me adjust my head, my neck, and my hips into a more relaxed position. Relaxation in the pool doesn’t come naturally to me. She helps me move my arms more gracefully. I think of the mermaid painting in my bathroom with the floaty arms and that becomes my visual. Beth kicks my legs for me, while I float high on the water, near the surface. Last week I was in the California high desert where between hikes, I delighted in the Mt. Whitney hotel pool — “swimming” underwater. My partner, Carol, did laps in the deep end one day, but another she huddled on the edge with a bunch of European guests — the water too cold, while I was that blue-lipped kid who wouldn’t leave the pool even when it began to rain, until forced out because of lightning. After my lesson, I got into the car with Carol and announced: I did it! I got it! I flipped from one side to the other and breathed! The child-like “I got it!” exuberant joy stayed with me for days. Beth showed me how to “swim” by rotating my hips from side to side with a freestyle kick. At first she turned my hips for me and I let her float me as I turned from my hips, torso, and shoulders — except my head stayed still as my eyes focused on the center line below me. I blew bubbles through my nose and came up for air when I needed it. The movements clicked. I could do the freestyle kick on my side and I was moving through the water. I was so excited and kept asking, “Can I try it one more time?” I tried it on my left side, on my right. I was so excited, this felt like swimming (without the breathing). I felt like Beth was excited for me too. I didn’t want to stop. Beth tried having me move my arms too, keeping my hands and forearms soft instead of tense. The arm and hand movements were harder for me to coordinate, but I promised myself I would keep practicing this. Beth helped me see that I was moving my upper arm too soon (one hand should be in the imaginary box above my head before I move the other). The challenges with my arms didn’t diminish my excitement over learning to swim on my side. After last week’s lesson I went home to my art studio and painted a boneless little mermaid, a reminder to keep my arms loose, to stay comfortable in the water like a mermaid in her element. In practice this past week, I tried to imitate real swimmers, moving my arms more like a “classic” swim stroke. It made me move faster and felt great. But I wished I knew how to breathe without standing up, like a real swimmer. I couldn’t wait to practice this side kicking stuff. First lesson? That was an attitude! It was a delight watching this child’s eagerness to get in the pool. She showed zero anxiety. Within a few minutes Beth floated the toddler across the pool. The girl grinned and laughed the whole way. She seemed as natural as a little mermaid. I thought that’s how I want to approach my lesson, my swim practice — with absolute joy and trust. I kept reminding myself that when things are most frustrating is often the point right before a big breakthrough. Between Open Studios and flying to London for my daughter’s wedding I missed a lesson, and had a two-week break between lessons for the first and probably the worst time in terms of my confidence. I felt funny showing up at Lesson Nine, having gotten into the pool only once between lessons, but I was determined to reclaim my joy and comfort in the water. I also wanted to feel some progress — I felt like I hadn’t made any breakthroughs (though I had) and was impatient. Beth was very careful with me. She didn’t want me to do anything that might trigger the vertigo. She didn’t have me flip over. I worked on my side kicking. I worked on my breathing position. Some of the apprehension began evaporating. I still was weak from the flu and took it easy. I didn’t experience the vertigo. Beth suggested I get earplugs to prevent me from getting water in my ears, which might cause vertigo. Being in the pool with earplugs was different. It made me focus internally — like meditation, instead of being hyper-aware of, or distracted by, the sounds or silence of the pool room. For these next two lessons Beth helped me work on side kicking in breathing position for learning backstroke. Switching from side to side, but not changing my head. She held my head in the correct position and let me do the rotating. As I kicked, I’d count to ten with one arm by my side and the other above my head, like at eleven or one o’clock if the top of my head was twelve; take one stroke and rotate to the other side — pivot my body but not my head. With Beth helping me, I could do this. It felt wonderful. I was getting the experience of swimming on my side/back and felt a rush of joy and excitement. But when Beth let go I could only keep going for a few turns and then things would fall apart. Beth reminded me that most of the people she teaches have a hard time learning breathing position and understanding the arm position. That made me feel not so different. I focused on my top arm, trying to feel the weight of my arm coming over my body. I tried to keep it relaxed. My movements were too big, too clumsy. I’d jerk my head back and get a nose full of water over and over. Beth reminded me the top arm had to be relaxed — when she tried to move my arm sometimes she couldn’t because there was too much resistance. But knowing that the arm has to be relaxed is not the same as knowing how to relax it. I can do the breathing position so much easier when kicking or starting on my right side than on my left side. I can only do two or three strokes before I have to stand up again to breathe, before the whole thing falls apart. I collaspe at my waist or tip my head too far back or forward. I forget what I should be doing with my arms. Anything that can be off seems to fall apart in that third or fourth stroke. Beth suggests it is the tightness in my neck sometimes and other times it is the weakness of my left side. When she positions my head I can do it — on my own, my side position falls apart. I’m trying to pay attention and acknowledge the weakness in my left side and not be so critical of it, or ignore it. Carol points out that most people have a side that is much weaker, which makes me feel less weird about it. She is my biggest fan and completely supports this endeavor to learn to swim. I loved the sensation when Beth helped me move. It showed me how it could feel — if I could just get there. I tried to go slower. I counted. I got dunked — my nose full of water over and over. Beth suggested a nose plug. I bought one but haven’t used it yet, feeling it would be a failure. Carol said all the greats use them. “Really,” I asked, “Michael Phelps?” “Well, Esther Williams,” she said. The timing for the two lessons in a row was the perfect balance after my hard time. I had two days of breathing position, of side kicking, of having Beth support my head – of enjoying the water again, of being inspired. I wanted to practice again.